The World Gold Hall of Fame recently kicked off its newest exhibit “Grace & Grit: Women Champions Through the Years.” The exhibit celebrates the sport’s most accomplished female champions from the early 1940s to present day, including highlights of 28 Hall of Fame members (as well as potential members). The exhibit features plenty of treasures from decades of women’s professional golf. 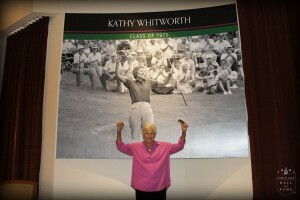 Visitors can see a Women’s Titleholder’s Championship green jacket presented in 1965 to Kathy Whitworth, who holds a record 88 tour wins (more than any other professional golfer—male or female).